MIAMI (AP) — The only 3-pointer that the Miami Heat made in the fourth quarter came with just about a minute to go, when Rodney McGruder connected from the right corner. Problem is, he stepped out of bounds first. And that sums up things right now for the Heat. The Brooklyn Nets were more than happy to add to Miami’s home woes. 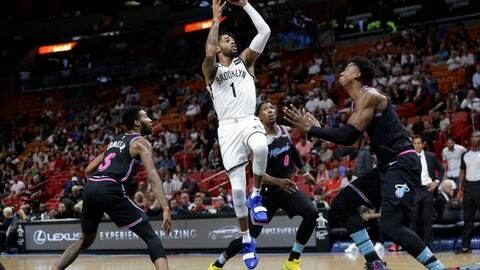 D’Angelo Russell scored 20 points, Jarrett Allen had 13 points and 14 rebounds and the Nets prevailed 104-92 on Tuesday night — handing Miami a fifth consecutive home loss. Then again, the Nets didn’t need style points. Spencer Dinwiddie scored 16 points for Brooklyn, which held the Heat to 36 percent shooting. Joe Harris and DeMarre Carroll each added 11 for the Nets and Rondae Hollis-Jefferson scored 10 as Brooklyn avenged a home loss to Miami last week. Hassan Whiteside had 21 points and 23 rebounds for Miami. No Heat team has ever had a home losing streak of five or more games and went on to make the playoffs. “We still believe in ourselves,” Whiteside said. The Heat couldn’t make much of anything all night, especially in the fourth quarter. They were 0 for 7 from 3-point range in the fourth, 7 for 13 from the free-throw stripe in that period — and were 4 for 19 from the floor overall in those 12 minutes, with the game on the line. And for the game, Miami was just 25 for 60 inside the paint. Josh Richardson scored 16 and McGruder finished with 15 for Miami. Justise Winslow added 10 and Dwyane Wade returned from a seven-game absence because of the birth of his daughter to score five points.